If someone were to sum up your life when you’re in your final days on Earth, wouldn’t you like it to sound something like Genesis 24:1? Someday, I hope it might be said of me, “Now Mark was old, well advanced in years; and the LORD had blessed Mark in all things.” Blessed in all things! Now that’s the kind of life I want to experience. In fact, I’d be happy with “Blessed in all things” as the epitaph on my gravestone. Of course, I’m also attracted to the “all things” part of this description. I’d like to be blessed — not just in my work, not just in my family, but in every part of my life. I’d like God’s grace to permeate my life and to touch the world through me. “Blessed in all things” doesn’t mean “protected from hard and painful things.” Abraham struggled with many things throughout his life, as we have seen in Genesis 12 through 23. Indeed, the previous chapter told the story of what happened when Abraham’s beloved wife died. He mourned greatly even as he sought to purchase some land for her burial. Was Abraham blessed in his wife’s passing? Yes, because the depth of his mourning was a result of the depth of his love. The more we are blessed with loving relationships, the more we will grieve when our loved ones are with us no longer. Yet, even in our grief, we are blessed, blessed with a God who is present with us, who comforts us, who bears our burdens. Blessed with a family of God’s people who weep with us when we weep, even as they rejoice with us when we rejoice. We are blessed in our grief because we know that, through Christ, death is not the end but only a step forward into the life of God’s future. The time will come when we will be reunited with those who have died, when we will share together in the luxurious blessing of God’s heavenly banquet. I’m hoping that today is not one of the last days of my life. Still, I want to set aside some time to consider the multitude of ways that God has blessed me. Perhaps you’ll be able to do the same. When you think of God’s blessing in your life, what are some of the first things that come to mind? Can you think of a way in which God has blessed you that you have not considered before? Are there blessings you have taken for granted? Can you think of times in your life when you’ve been blessed even in the midst of sorrow or suffering? Gracious God, yes, you did bless Abraham in all things. And you have blessed me similarly. I ask you to guide me now as I consider your many blessings. Bring to mind those that I have overlooked. Fill my heart with gratitude for your amazing grace to me. Thank you, gracious God, for how richly you have blessed me. Amen. 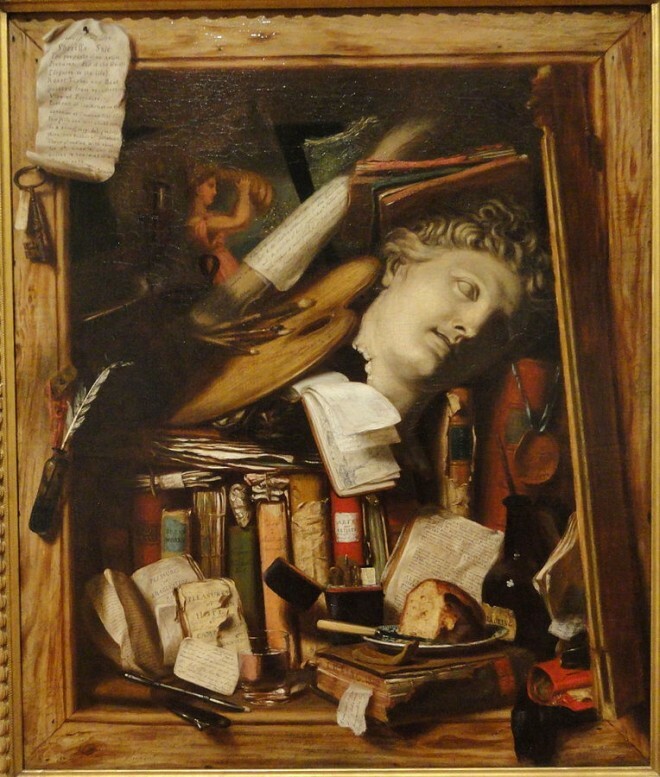 Photo Credit: “The Vanity of the Artist’s Dream by Charles Bird King, 1830 – Fogg Art Museum – DSC02281” uploaded by Daderot. Licensed under CC0 via Commons.